I’ve not been very good about blogging, so let me update. The Longest Night trilogy has been put on the back burner for now. The worldbuilding will not go to waste, however: I have started work on a stand-alone novel, Shadows of the Mind, which could become first in an open series. The book tells of Gaius Meriwether, a junior clerk with the law firm Lewis & Poe, and how gets involved in an organization that tracks down and destroys the knowledge of how to summon creatures from the Outer Darkness. The story was originally intended as a follow-up to the trilogy, tying up a planned loose end. I’m a few chapters in, and feeling much more confident about this story. More about that later. I haven’t been particularly active in the job search, so I am still in quasi-retirement. At first it was to focus on my writing, but when I started looking at what was available, I realized that my skill set was not exactly up to the task. So I started, and recently completed, a certification course in Ruby on Rails offered by the University of Washington. I have also started classes at Seattle Central, with an eye towards transferring to the UW and getting a bachelor’s degree: I have an AA in mathematics, but my effort at getting a BA (mumble) years ago fell through because of financial difficulties. The last time I sought employment in technology was during the Dot Net boom, when having a four year degree meant that you had wasted your most productive years; alas, that is no longer the case. If a good job offer comes up, I will drop the school plans, but until then, I will be furthering my education. I will be returning to the Norwescon convention committee for 2016, as both lead for the Biological Sciences Track and as head of Stage Management. I have also been re-elected to the Guest of Honor Selection Committee, which means I will be one of the folks choosing the guests of honor for Norwescon 40 in 2017. I am very excited to be a panelist at my first Worldcon! It’s in Spokane this year, August 19 through 23. If you are there, stop in to the panels I will be on. Edit: I’ve been added to the Future Pharma panel. How will biotechnology and genome research revolutionize pharmaceuticals? How can biotech be better integrated into fiction? This panel will help provide an understanding of the diversity of contemporary and theoretical pharmaceuticals and how biotechnological breakthroughs can help move a plot along. Pandemics make frequent appearances in SF. But are what we read in books or see on the screen anything like real pandemics? The world just experienced the Ebola pandemic. The panel will discuss how real pandemics are likely to play out, and how that compares with their depiction in fiction. Fiction has evolved from presenting all characters born with a specific gender and sexual orientation to presenting a broad spectrum of genders and sexual orientations. What are some of the early works to explore these areas? Who are some of the best authors exploring them now? Does the gender/orientation of the author matter? More information is available to you today than at any time in human history. But how can you tell which information is reliable? Pseudoscientific claims have always been around, but they have even more traction in the Age of the Internet. How can you distinguish legitimate science from pseudoscience? What are some of the major pseudoscience memes circulating today? What, if anything can we do about them? An orientation seminar for new Worldcon goers on what the con is about and what to do this weekend to make the most of it. Have fun! Bays 111C How Can We Make Fandom More Welcoming and Inclusive? More and more people read SF, watch SF movies, game and costume all the time. What can we do to make fandom, clubs & conventions more welcoming to all kinds of people? I am head of Stage Management this year and I am editor/publisher for the Daily Zine, so when you catch a glimpse of me running around with a panicked look on my face, you will know why. Fortunately, I will get the chance to sit and catch my breath on a couple of panels. If you are going to be at Norwescon this year, stop in and say Hi. Not every disability is apparent at a glance, nor is anyone’s personal health anyone else’s business. From mental illness to chronic disease to a variety of syndromes and impairments too lengthy to list, we’ll discuss the difficulties of living with chronic health conditions, the stigmas associated, what progress has (or hasn’t) been made in reforming public perception, and strategies on getting other people to mind their own blasted business. As a part of their world building, some SFF writers create new languages. Most are used as naming languages or to flavor insults and courtesies; a small few become entities themselves, with thousands of speakers and an impressive body of translated and original literature. Join us as we discuss what is involved in creating your own language, and how much work is needed to get the results you want. From miraculous cures being suppressed by Big Pharma to proof that the earth is actually flat, charlatans and con men have been pushing nonsense for centuries in the hope of parting the credulous from their cash. Join our panelists as they discuss pseudoscience, its impact on society and how you can tell good science from bad. There are many reasons to conduct tests on animals when developing new drugs, surgical procedures and medical technology. But are they good reasons? There’s more to queer culture than just those things the letters usually cited “LGBT” stand for. In addition to Gay, Lesbian, Bisexual and Transexual identities, there are others, like Intersex, GenderQueer, Asexual. Some of these identities have been drastically under-represented in Queer discussions. Come find out more. NOTE: We have a “no outing” policy toward sexual identities. Make sure if you’re identifying someone else that you have their permission. Or better yet, just don’t do it. Norwescon is one of the largest fan-run and fan-managed science fiction and fantasy convention in the United States. It is held in SeaTac, Washington. She held up the dress and smiled. Despite the conservative cut, it covered only three dimensions: not exactly boardroom attire but it would serve to keep the Old Boys off balance until after the vote. Perfect. Tossing it onto Her bed, She turned back to the closet to find just the right shoes. Flash fiction: complete stories in 55 words, including title. I haven’t been making as much progress on my novel as I had been hoping, so I’ve signed up with National Novel Writing Month to help keep me on track. 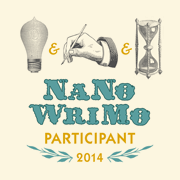 The challenge is to write 50,000 words of a new novel from November 1 until the deadline at 11:59PM on November 30. It doesn’t have to be perfect, a first draft is fine: the focus is on completion. My name on the website is GGadow. I encourage people interested in becoming a writer to sign up and get to work. Blasphemy Rights Day International is observed September 30. It promotes the idea that one should be allowed to examine, discuss, even criticize, religious beliefs and practices exactly as if it were any other topic. Sadly, in much of the world, this kind of discussion is hampered by laws that criminalize “offending” the religious beliefs of others. Code Like a Pirate: Arrr! Goodness, I has been a while. Ok, here is a little something for Talk Like a Pirate Day. Or as I like to call it, Code Like A Pirate Day. And so I present to you the language Arrr! The standard “Hello, World” example looks like this in Arrr! extort mate "Who be ye?" says I! parlay mate + " be a scurvy sea dog"! Arrr! is case-sensitive, with all keywords in lower case. Pirates don’t bother much with capital letters. Statements end with an exclamation point. When pirates speak, they speak emphatically. Except as needed to separate individual words, whitespace is ignored: tabs, spaces and line breaks can be added as needed to improve readability. Code libraries are linked using the keyword savvy. Code blocks begin with ahoy! and end with avast! Names cannot be a reserved keyword. They may contain any number of alphanumeric characters, but must always start with an alpha. Because Arrr! is case-sensitive, treasure, Treasure and TREASURE will be treated as different names. Array variables are declared using the keyword plundered, followed by the number of elements in the array. A variable named “treasure”, defined as an array of eight integers, would be declared using tharbe treasure plundered 8 dubloons! Individual elements of the array are accessed using square brackets. Pirates have more important things to worry about than figuring out zero-indexed arrays so the first element of the array would be treasure. Input from the default input device is retrieved into a variable using extort variable name text says I! Output to the default output device is sent using parlay text! The text can be any valid text, with string variables concatenated using +. That’s all I got so far. Hope you enjoyed this! Our panelists discuss and recommend recent science fiction and fantasy from LGBT creators. Genetic manipulation is only just beginning to challenge our understanding of medial ethics. What potential science fiction themes and stories arise from these circumstances? What SF authors and works have already begun to address the questions of genetic manipulation and medical ethics? Our panelists relate funny things that have happened in Science and Tech related fields (but you’re really happy they didn’t happen to you!). Warning: you may be sore from laughter after this panel. Science fiction and fantasy are genres with great opportunities to explore ideas and concepts without the constraints of current reality. How have these genres explored the complex and multifaceted subject of human sexuality? Our panelist indulge their penchant for “oh, come ON!” in discussing the science, pseudo-science, and outright balonium in recent SF, whether in print, media, comics, or wherever! NASFiC is held in North America only in years when Worldcon is held elsewhere. Since Worldcon is in London this year, a NASFiC is taking place. Martial law and the vaccine had been successful, and the remnant of humanity danced in the street at the destruction of the last monster. But beneath their feet, the virus had found a new host. The city’s vast population of rats began to die and wake again, hungry for human brains. So very hungry. This story was inspired by a discussion at PZ Myer’s blog Pharyngula, titled My Zombie Story. A few weeks ago, I got laid off from my job. For most of the almost 18 years I was with the company, I was the in-house developer for the desktop applications we used in the back office, and the designer / programmer for the website we had for our field agents. In that time we grew, going from about 150 agents to almost 500. The executives decided a few years ago to start outsourcing a lot of the tech work: since we were a consumer of technology rather than a producer, they saw that it was a better value to contract out the larger projects to people who already had the necessary skills than to have the company cultivate those skills internally. Little by little, projects got turned over to third-party vendors, and for the last year I was largely doing make-work to justify keeping me on the payroll for the minor odds and ends. Eventually, we both acknowledged that there was not much reason for me to stay and came to a mutually agreeable separation, with severance and everything. I still go in occasionally to help train the person taking over what is left of my projects, but that leaves me with a lot of time on my hands and no immediate need to find a new situation. What is a wanna-be writer to do? Hmm…. So, I set up a “writing den,” a nice, reasonably distractionless part of my apartment where I can concentrate on writing. A bright corner with plenty of indirect natural sunlight. A few houseplants to sooth the eye. A fan to improve ventilation on days that are muggy or warm. A padded chair with lumbar support. Desk at the right height. My laptop, which does not have World of Warcraft installed on it, nor Dragon Age, nor The Sims 3. The first three and a half chapters had been written, so I settled down in this nice, reasonably distractionless part of my apartment and finished chapter four. Then I started work on chapter five. And sat there. Edited what I’ve written. Sat some more. Watered the plants. Sat and stared at the computer. Opened the window and adjusted the shades. Edited what I’ve written. Sat. It took me two weeks to realize what my problem was. The Longest Night has three narratives, loosely intertwined and only occasionally touching. I was trying to write the chapters as they would occur in the finished novel; makes sense, right? Unfortunately, that meant switching point of view after spending time looking at the world from someone else’s head, and I was having trouble switching gears. Then it occurred to me in a flash of light so blindingly obvious, it hurt: the story has three narratives, loosely intertwined and only occasionally touching! I spent this morning rewriting the outline, splitting it into three separate works. Once that was done, I split what I had written into three separate files, each of which will become a novella from a single character’s point of view. This way, I can stick with a character for as long as I want and move between them when I am ready, not when the story arc requires. When the novellas are finished, I will interleave them to create the finished novel. I will be at the Fremont Fair and Solstice Parade tomorrow, so I don’t expect I will get any writing done then. Refresh the batteries by browsing craft booths and eating fair food, you know how that is. Sunday, however, I will make progress on the book. I will. Or at least, I will sit in front of the laptop and try not to edit what I have already written. Please read the Comment Policy.